What no one seems to argue is that Robyn Nevin, who plays the drug-addled family matriarch, Mary Tyrone, is an actor whose likes we rarely see. Nevin is a legend in Australia (this is a co-production of the Sydney Theatre Company and Portland’s Artists Repertory Theatre) and her performance here shows exactly what the non-Down Under world has been missing. Simply put, they don’t come much better than this. Nevin’s Mary brings to mind the broken butterflies of Tennessee Williams (and, yes, many of them are iron butterflies, but they are broken nonetheless). One friend, who happens to be one of Portland’s finest actors, confided that she plans to return, next time to a close-up seat, and spend the entire performance studying what Nevin does. Suffice it to say that this is a model marriage of closely considered technique and daring emotional abandon, and that you simply must see it for yourself. Another point of non-contention is that Todd Van Voris, the lone Portland actor in the cast, is sensational as the dissolute older brother James Junior. Physically, Van Voris is something of an odd duck, a bit in the Philip Seymour Hoffman mold, not what you immediately think of when you think of Jamie, the matinee idol’s son. But the point is how he inhabits the character, and Van Voris makes you believe that this is precisely who James Tyrone Junior is — a drunk who could be so much more; a son who stands up and then some to an impossible father. Some of this production’s most crackling scenes are the sparring matches between Tyrones senior and junior, in which Hurt and Van Voris go at it like Sonny Liston and Muhammad Ali: float like a butterfly, sting like a bee. But what about Hurt, the big name in this production, the Academy Award-winning actor who made the whole thing happen? He’s here because he has some Oregon connections — his mother is buried in eastern Oregon, he began his stage career at the Oregon Shakespeare Festival in Ashland (where he met another young actor, Allen Nause, who is now Artists Repertory’s producing artistic director), and he’s appeared twice before at Artists Rep, in Drawer Boy and Vanya, an adaptation of Chekhov’s Uncle Vanya. 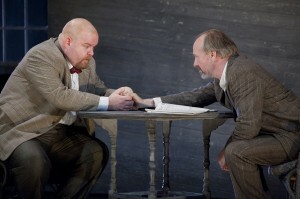 Hurt is known in theater circles as a difficult actor, an actor whose intense dedication to the stage can seem like a dedication to the ego of William Hurt. I’ve heard stories, but I don’t know: I’ve never met the man. I do know that, unlike the great majority of American movie stars, he is deeply devoted to the legitimate stage, and he throws himself intensely into whatever role he takes on. I also know, from watching him up close in three stage productions, that he likes to go against the grain, to challenge the received assumptions of how a particular role should be played. So it is with James Tyrone Senior. Before curtain on Saturday night I commented to a friend that I’ve always thought of O’Neill as a symphonic writer, repeating themes and even passages in slight variations. After rewatching Long Day’s Journey, I’m ready to add opera to O’Neill’s structural bag of tricks: This play consists of a great number of arias, long and emotionally complex, that demand difficult feats of skill on the part of the performers, who must push the narrative forward even as in effect they’re stopping the play in its tracks with their virtuoso solos. A couple of days after the fact I’m still not sure whether Hurt’s interpretation is an important rethinking of the role or, as a friend who happens to be one of Portland’s best writers angrily declared immediately after curtain, an irresponsible and deadly boring ego trip. But I do believe this: Like Miles Davis in the early 1950s, Hurt plays against every preconceived notion of what a solo is and what it ought to achieve. Is he right, or is he just stirring up trouble? Damned good question. Hurt is a cold performer, and cold, although it’s certainly a part of James Tyrone Senior’s complex emotional makeup, is not the first thing that comes to mind when we think of JTS, the Irish charmer, the matinee idol, the master of blarney and charm. Hurt emphasizes the bruised Yankee Irishman in James Tyrone’s emotional makeup, the pennypincher who learned from his own father how cruel and arbitrary the world can be, and who is devoted to the idea that when one manages to catch an eagle in one’s hand, one must squeeze it until the eagle grins. Hurt’s James Tyrone is a parsimonious man, a man whose every emotional impulse is stunted by his certain knowledge, no matter how false it might be, that economic disaster is likely to arrive at any moment, and that that one sure fact must take precedence over anything and everything else in life. Approaching his performance with a stolid four/four beat while everyone else is acting in syncopation, Hurt is magnificent in his parsimony. The question is, is parsimony the complete measure of James Tyrone Senior? What about that fabled charm, the charm that makes it possible for Tyrone to become an economically successful if artistically stunted matinee idol? Hurt displays none of it: none of the magnetic interpersonal complexity; none of the insinuating vocal suaveness that intoxicates both his family and his fans. Hurt’s Tyrone is stripped down to the core — except that maybe, by sacrificing the man’s charm, it ignores a vital element of what that core is. It’s important at this point to bring up a curious truth about a certain kind of masterpiece, and that is that certain roles are essentially unplayable — that is, they are so emotionally and intellectually complex that no single actor can encompass every possibility of them. That’s why we are so often disappointed with productions of Hamlet and King Lear, no matter what great actor may be starring in them: the roles are simply bigger than any single human being. Tackling them is like Jacob wrestling with the angel. You’re going to lose, and your thigh will probably be thrown out of joint. But it’s the wrestling that’s important. So it is with James Tyrone Senior. How Hurt’s performance measures up depends to a large degree on what an individual audience member’s expectations are. In my own conception of JTS, charm is an essential part of the package — the atrocities of James Tyrone are subterranean, and his charm is why so many people are willing to underplay them. If he’s going to be played by a movie star, I can’t help wondering how, for instance, Jeff Bridges, who has already hinted at the emotional breadth of the role with his spellbinding performance in the movie Crazy Heart, might do at it. But in a way, that’s foolish talk. Bridges isn’t a stage actor. Hurt is. And what Hurt has given us, if it’s contrarian and incomplete, is a James Tyrone Senior to knock around our heads and hearts. He doesn’t offer us answers, only questions. And isn’t that just the way it is with art? 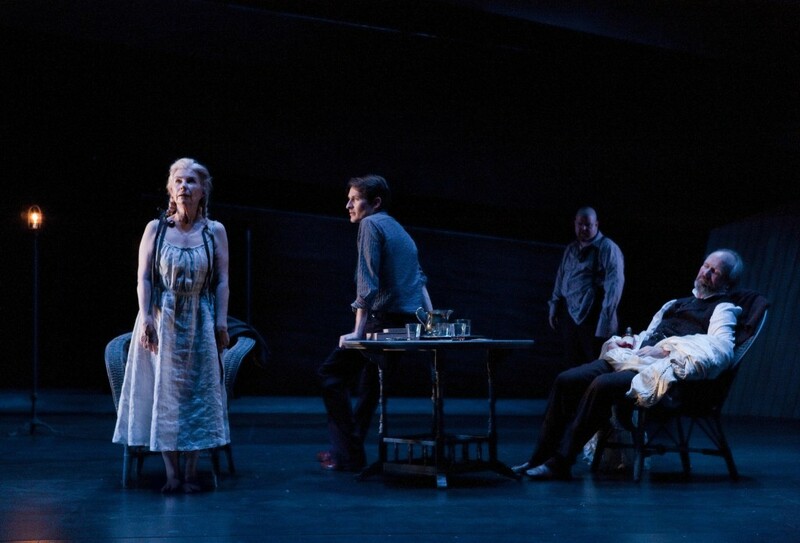 Robyn Nevin, Luke Mullins, Todd Van Voris and William Hurt in “Long Day’s Journey Into Night.” Photo: Brett Boardman. Todd Van Voris and William Hurt: son and father, duking it out. Photo: Brett Boardman.